The Washington Wizards beat the New Orleans Pelicans 124-114 last Saturday night in Washington. The momentum from that game seems to have carried over in both directions as those teams prepare to meet again Wednesday night in New Orleans. Washington stayed at home and defeated the Houston Rockets, 135-131, in overtime Monday night. 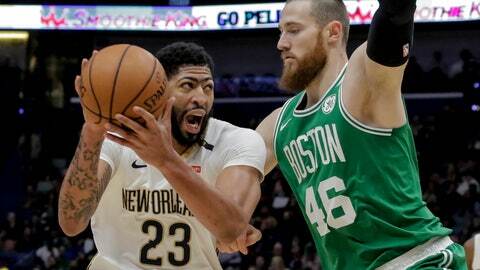 At the same time New Orleans was struggling in a 124-107 home loss to the Boston Celtics. The Wizards are feeling better about themselves after winning three of their last four. The Pelicans are regrouping after losing four in a row. The Wizards’ mini-run began when coach Scott Brooks put Kelly Oubre, Jr. in the starting lineup in place of Markieff Morris. Washington was just 5-11 prior to the lineup change. “Since we’ve made the lineup change, everybody’s just accepting their role,” Wall told the team’s website. “No one’s worried about who’s getting the ball, we’re just focused on the defensive end. The Pelicans loss to the Celtics was just their second at home in 10 games this season, the first in which All-Star forward Anthony Davis played. They committed eight first-quarter turnovers, fell behind by 20 points in the second quarter and could never catch up. When the team returned to practice Tuesday morning, coach Alvin Gentry didn’t review the film with the team. He said the film would only show mistakes the players were already aware of. “We needed to be on the floor and try and correct those things,” Gentry said. “We’ve got to get back to who we are. As a result, New Orleans has lost four games in a row. It has allowed an average of 36.3 first-quarter points in the last three games.